I am Joanne Duka. I was born in the Philipines but I was raised in California. Coming out of school, my parents wanted me to make a lot of money, become a doctor or an engineer. I didn’t like touching people so I chose engineering. In the meantime, I was also working as a visual merchandiser for Forever 21 and then I switched and went to Victoria Secret. My friends were telling me that I was really good at this job and that I should go into interior design. So I quit engineering and went to the Academy of Arts University, even if my parents clearly thought I was crazy for doing this. Every year, I would give them my portfolio to show them all the beautiful things I did but they didn’t undestand. While I was still studying I was interning. I started an IIDA program at the Academy of Arts. They only had ASID. While I was interning, my boss was really helpful and guided me a lot. The building you wish you had designed? GS: The «De Young» in San Francisco. I’m a big fan of Herzog and de Meuron. 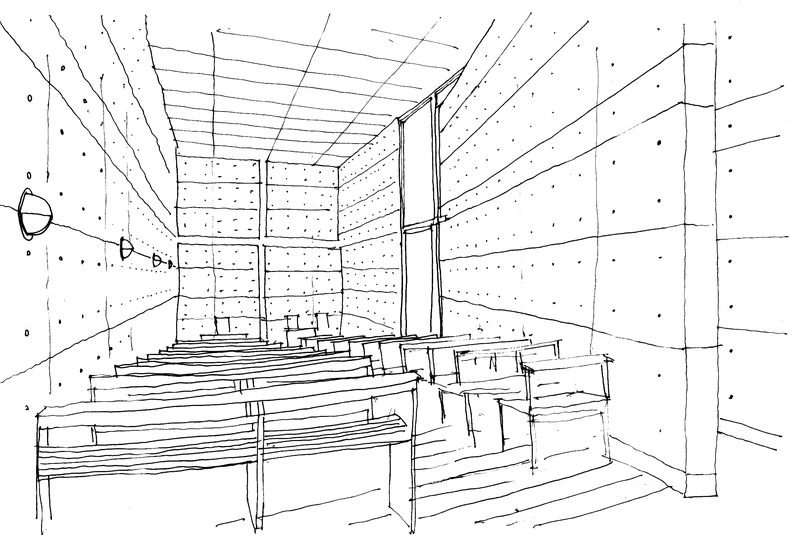 JS: I think my favorite would be the Church of light of Tadao Ando. JD: I wish I could redesign the new bay bridge extension because it looks horrible . The project you designed that makes you proudest? JD: Definitely the Juice Bar that I’m doing right now. It has really nice colours. It’s very sleek. It defines me. I’m all about a design that speaks for itself and defines me, and I fought hard for that project. JS: I worked on a lot of large family structures. There was a project that I did: all the other architects were only focusing on how to cram people in the building but I thought we really should focus on the courtyards and the solar exposition: the sun coming into the project. I was really happy because I introduced design in a project that was pretty much only about accounting. SL: Two projects actually: one was very long ago. It was a Museum of natural history, I was in charge of designing the dinosaur exhibit. It was a permanent exhibit. The second one was more recent: a few years ago I did some design for the disney cruiseship line for a fifteen hundred seats restaurant. GS: A grand single family residence in Switzerland on the Lac Léman. The property had a massive old house from the 1850s that we completely remodelled. We built a new pool house: another, completely functioning 3 bedroom house. It was going to be a pavillion but it ended up being a real guest house with heat in winter. It was really neat because the main house was so old and the pool house was so new. We worked on this contrast between the old white house and the new black pool house. The pool house was black stained wood, glass, super modern, funky-shaped, in a great way. A striking detail in one of your projects? JD: Definitely the lighting structure for the juice bar: round shades, wood chips that peel and they made circles out of it. When you look up, it glows orange on top of the juice bar. From far away it captures your eyes and you can see it when you’re coming up on the escalator. It’s really simple and really pretty. GS: The pool house: we had a wood connection detail that had glass around it. The inside wall was comprised of a pattern of spaced wood vertical members, and then the wood beams continued on the ceiling, like an interior skin, covered with the glass exterior skin set away from the wood. JS: We were doing this small café and at the last moment I decided to put up this… it was easy to detail. I really thought they would never build it. It turned out wonderful and really easy to build. I was really surprised and it looked absolutely fantastic. SL: The design and integration of custom furniture for the Disney cruise ship project. The project you would never design? SL: I hope it never happens but if I ever had to design a fast food restaurant, please shoot me. JD: I don’t think I could design a hospital. There’s nothing really creative for me to do in hospitals. There’s really cool ones though but I think I’d be bored about it. GS: I think I will stay as far from hospitals and jails as I can. JS: One of the things I find the most offensive is when someone has enough money to have something incredible built for them, but they don’t build it in context: a French château in the mountains… Between the waste of money and the lack of an original expression, it sickens me. The ideal or perfect city? SL: It’s a disneyland for adults. Beautiful spaces in almost every building you enter. GS: My ideal city is Paris. I lived there three years. I haven’t lived in another city that compares to paris. SL: It’s a question of density of the city: how density makes a livable, workable city: San Francisco, New York, Paris, Shangai are ideal cities. JS: I like the transportation system Copenhagen, the way they have dealt with pedestrians and bikes. But I could never live there, it’s too cold… So it will be a warm Copenhagen. The first time you felt like an architect? GS: When I went on my first construction site in Switzerland. SL: When I entered architecture school. JS: It’s a very condescending way of thinking, but I try not to feel like an architect too much. I try to stop myself when I feel too much architectural! I don’t know if I ever had that moment. JD: I’m not an architect. The first time I felt like an architect, I hated it. My boss said «here is some measurements, put it in cad». Why am I inputting these numbers in a computers, I’m an interior designer, I’m supposed to touch pretty things. The most ridiculous building in SF? JD: The super tall buidling that is blocking the skyline, and that you can see when you’re coming from Berkeley. GS: I can’t stand the hotel intercontinental. It’s got these weird lily pad things and the horrible blueish-greenish glass. SL: I agree with Gabrielle but another hotel that is really bad is the jukebox. JS: The worst building are the coffee cat windows. They’re on every building. The question that is bugging you? JD: Am I going to make money working this way? SL: When the hell will clients stop thinking we do stuff for free? It comes to the question of what are the expectations today. Design is a process and people expect us to be fast and cheap and I hate this word «cheap». GS: Why can’t we have decent salaries? Some friends working in other industries didn’t believe me when I told them my salary, then explained my degree and years of experience. JS: Knowing if this is the right profession for me. The diminshing rôle of architects in the world. Once, the architect was the one in charge of everything, organised the work, the design, and now everything is being taken away from us. Do you prefer talking or drawing? JD: I’m more about talking all day about architecture and design. JS: I prefer any graphic medium over verbal. The song you’re listening to over and over again? JD: I like Hawaiian reggae music. I love how happy it makes me feel. GS: Any Florence and the Machine or Lana Del Rey song. Your message to young architects? JD: It’s not as glamorous as people think. GS: II would encourage young architects to try and find a style of architecture that they like and will be happy to do every day: archite ture is for passion, not for millions of dollars. JD: I disagree, I think you should put your foot into everything and someday, somehow you’ll find your niche. Check out everything. JS: I guess I would echo Gabrielle: keep your options open and always look for the most adventurous ones. Don’t get stuck in financial or mental debts. If you want to do something else, something great, please push the profession forward. I’ll quote Jonathan Seagull: «get to the front of the bus». SL: Dive into a wide range of subjects other than architecture. Practice architecture. Who is the architect that accompanies you? JD: I love Mondrian because I believe he’s a little like me. You want to pop out and you want people to remember you because you’re not boring. SL: I don’t know if there’s one person. I think that every time I start to do a project, I feel like I don’t know what I’m doing anymore, but in the process, if I looked to a way of thinking, it would be towards contemporary artists. I believe that they have the time and method to do research. GS: IIeoh Ming Pei. I would love to have a conversation with him. He’s really inspiring to me and I’ve always been intrigued by his work. What you remember about your student years? GS:I remember a lot of fun, many super late nights, but overall tons of creativity. I didn’t even know what stress was, and I thought I dwas stressed. SL: I love the camaradery. Architecture was the most important thing in the world. JD: Learning a lot from international students. How they designed, it was so different… Late nights when we would eat chocolate and chew gum because we didn’t have time to eat. I didn’t even know what a budget was. I did have a lot of fun in design school. JS: I miss the freedom and purity of it all. If I had to do it all over again I would probably push even harder. I remember being creatively exhausted. SL: Working in Shangai or Buenos Aires. GS: Going back to residential design. JS: Whatever presents itself in the way that is most rewarding financially.